The following are permanent discounts & specials. Collect any gear on Friday 22nd December 2017, return January 8th 2018, and pay only 1 day hire. Some terms & conditions apply. Some gear not available for this special, talk to us today to book your gear ! Studio bookings are subject to availability and are on a stand by basis only. Please check with our team on studio calendar and gear availability before booking. Book any gear for the weekend, pick up on Friday between 5-7pm and return by 8am Monday and pay for only 1 day hire. If it’s a holiday or a long weekend, the return can be made on the following business day for the same price. Please note, we do not extend the weekend hire past this period of days. If your booking begins and/ or ends before or after Friday and Monday, then all days will be charged accordingly. Weekend special applies to non commercial bookings only. Call us on the day, or between 6-7pm the night before, to book a studio for non-commercial work at 50% discount. All NZIPP & AIPA members receive an automatic 10% discount on gear hires. Please show us your student I.D. and you will get an instant 25% discount on any personal, non-commercial projects. We ask you to consider what benefits your charity can offer Kingsize in return for any discount we can provide; this maybe in the form of logo placement, free advertising, free goods or services, press, social media, etc. Please note that we do not discount hard costs, such as consumables or labour. We have supported countless such productions over the years, and believe it an important initiative to support emerging film makers. We offer a standard 25% discount. NOTE: Any music videos shot at Kingsize must not use amplified sound or live instruments. Because Kingsize is a shared facility with adjoining studios, and because we are located in a residential area, we cannot allow loud noise. 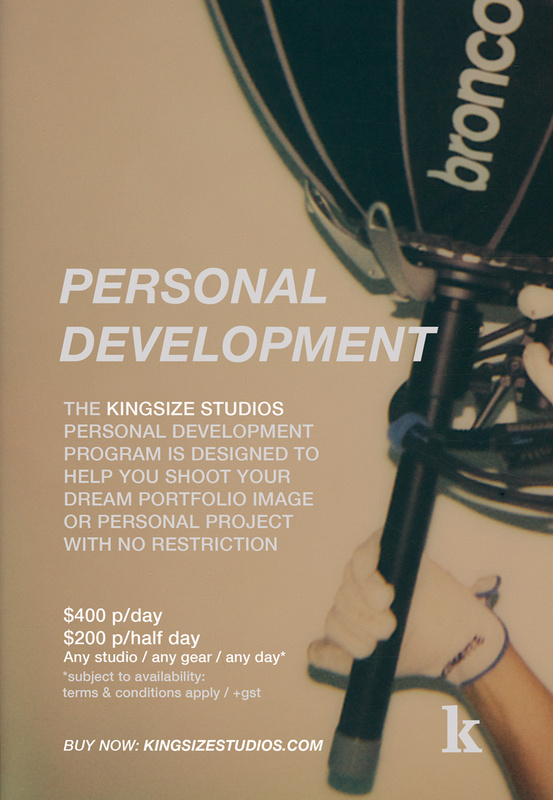 We have special rates for advertising/design/creative agencies shooting non commercial projects in studio. These might be in-house, charity, awards documentation or pitches. Please call to discuss. With annual membership, you can enjoy exclusive benefits that only members are offered. Suitable for photographers/creatives of any level of experience, we place an emphasis on learning, professional development, and the simple joy of photography and the moving image. JOIN THE CLUB.